As an avid traveller and also an environmental advocate, it has always been difficult for me to justify the carbon emissions I cause by flying. I've thought about this problem a lot. 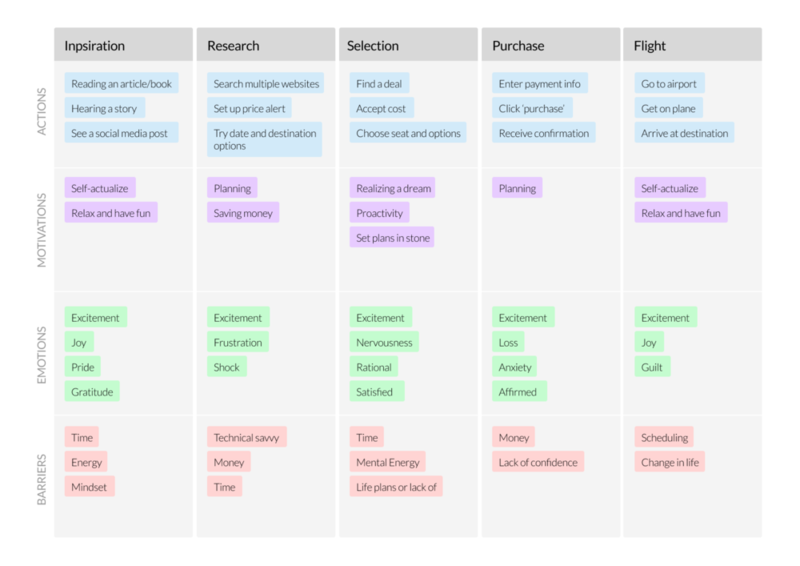 I decided to see if other people dealt with the same guilt while flying by interviewing 15 environmentally-minded frequent travelers and creating a journey map based on their responses. Below is the flying process, from inspiration to the actual flight. I found that aside from frustration with pricing and some anxiety while flying, the strongest negative emotion involved in the flying process is guilt because of the environmental impact of a flight. Interviewees described this as 'tainting' their overall travel experience. But, although all interview respondents said they cared deeply about their impact on the environment, 0% said they planned to change their flying behavior. These findings led me to the question: How might I help people reduce their travel-based carbon footprint through technology? Concurrently, I found that it is fairly simple to quantify the amount of CO2 emitted on a flight based on the kind of plane and distance traveled, given a few assumptions. And I found that certain environmental nonprofits were tracking their own impact based on the amount of CO2 they were able to offset. Could this be the solution? Through research and definition, an idea was born: help people offset their flights using an accurate CO2 calculator to connect them with nonprofits that could offset their carbon. I wanted the solution to be consistent, simple, intuitive, accessible, and delightful, so after a lot of sketching, I started off my wireframing process by building a basic styleguide, which will evolve as the product develops. With a basic styleguide in place, I was able to quickly put together first mocks to present at a business plan competition.